H. P. Lovecraft’s brand of cosmic horror has long forced readers to an inexorable truth—there are powers in the universe whose immensity dwarfs petty human conflicts. Inspired by Lovecraft and brought together by editor S. T. Joshi, the stories in Black Wings of Cthulhu 5 explore the very essence of fear. 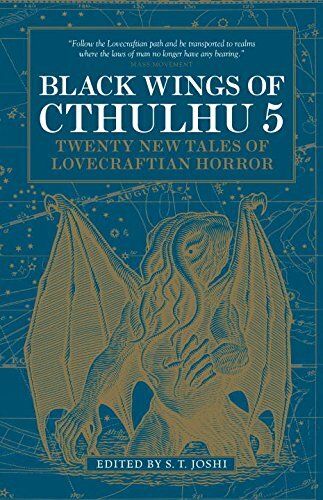 Between these covers lie many of the finest Lovecraftian authors, including Sunni K Brock, Donald R. Burleson, Mollie L. Burleson, Nicole Cushing, Jason C. Eckhardt, Sam Gafford, Wade German, Cody Goodfellow, David Hambling, Lynne Jamneck, Mark Howard Jones, Caitlín R. Kiernan, Nancy Kilpatrick, W. H. Pugmire, John Reppion, Darrell Schweitzer, Jonathan Thomas, Donald Tyson, Robert H. Waugh, and Stephen Woodworth.